Hi there, this is my 95 Shadow trike. Hope you like it. I sure do. I have only had it since last June and have ridden it almost 10,000 miles. I am a 56 year old grandma who loves her motorcycle. Have been riding bikes since 1970 and loving every minute of it. I started out on a Puch, and have 20 motorcycles now, including a Z50 and several sized bikes all the way up to a 1500 GW with 2 passenger sidecar. This is my fifth motorcycle. The last street bike I had nearly did me in. It was 1976 and I was 19 my wife (pictured) was 17. I was on a Honda 750-four she was on the back holding me tight. A car pulled a U-turn in front of us, we were going 60 mph. We were lucky and had only minor injuries. The bike was totaled. After a few trail bikes you can now see that my wife and I are once again enjoying the open road on my new 1998 Honda Shadow. I guess you could say she really trust me, to get back on the highway again. It's a great feeling to cruise the Rocky Mountains here in Boise Idaho. If your ever in Boise look me up, we'll go for a ride. Hi there! This is NOT Christer or "Krell" as he is nicknamed, here. My name is Micke Ekeberg... I am a friend of Christer (featured above). Who bought an "Ace" last fall. He has been "upgrading it" with, for example: A Vance & Hines exhaust pipe ´n new jets for the carbs. 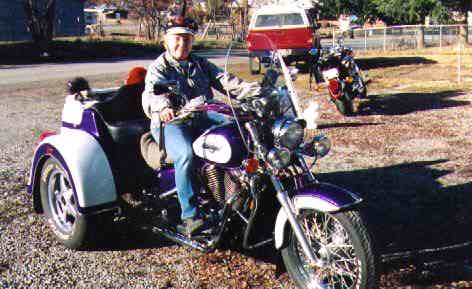 Ever since I told him about the "Honda Shadow Home Page", he has been on my back to have me take some pictures 'n send them to you. Well I've just done that, with a "Canon ION" (not the world best digital camera *ahem*). His name is "Christer Eriksson" ´n lives in Karlstad, Sweden. He doesn't have an e-mail address at the moment, so if there´s anything going on when it comes to Shadow ACE (real or virtual), mail could be sent to me (mic@xpress.se), ´n I will forward it to him. I read about your dilemma about webspace so I include links to the full size pictures, which I have stored in an area that my internet provider has allocated to me, (normally used for home pages). If you would be interested in more pic´s of the bike alone (sorry to say it´s the same quality (the pic´s I mean)), mail me ´n I´ll upload a few more in my end. I am sending you a couple of new pictures. One of my wife, Holly and myself and the other of just myself with my Shadow ACE. In the background is a picture of the Diablo Lake Dam, from the Cascade Mountain Highway, in the North Cascades, in Washington State. This is a wonderful day trip, about two hours from the Seattle area. There is an old resort there that has turned into a ghost town. It's always very quiet and rather eerie! The water over the dam itself falls about 150 feet into the gorge below and passes two towns, Diablo and Newhalem, built for the people that work for the power company. Above the lake is another dam, the Ross Lake Dam. To get to it one has to take their boat or ride the power company's tour boat. Above that dam is Ross Lake, it runs about 30 miles north into Canada. Both lakes have "boat access only" camping. The views are spectacular, the ride is wonderful, and there are always interesting people to meet. My name is Rick Scriven and I am a fourth grade teacher in Washington State in a little town near Puget Sound. I have been riding for about twenty years but I have been impressed with the Shadow since it came out. I finally mortaged my wife and children and bought a '96, 1100 Shadow ACE- this has been a dream come true for me for years now. I kept a picture of it on my computer (still have it) and I looked at it daily. It was such a joy to finally buy it last July. I even got the color I wanted, red! I have taken several trips already. My favorite trip was traveling on interstate 84 along the Oregon side of the Columbia River...lots to see. I have also driven up and down the Interstate 5 corridor and visited the many sights there. Among them are Mt.St.Helens, Olympia and Seattle, and of course Portland. My wife or one of my three children always joins me and we have a ball. Rockin' Dan is In The Wind!